I'm sure we've all noticed the large amount of construction around our way...from the weird motel-like building on 39th Street (in addition to the confirmed hotel on 39th between 8th and 9th Avenues), to the "We're right next to the green space of Green-Wood!" condos on 36th and 4th, to the new apartment building that grew out of the parking lot of a funeral home on 43rd and 4th. Then, of course, there are the dozens of smaller brick and "Fedders" buildings that are built on various occupied and unoccupied lots. Cititour has a highlight on Sunset Park today. 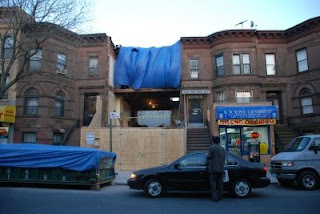 It shows horror at someone's choice to tear down a brownstone building and replace it with...well, we just don't know yet. The image below is from Cititour.com.